Wow, definitely a close match. Her doll was so worn it is difficult to tell for sure. I have purchased the cat and can’t wait till it gets here. My husband and I are already thinking up a few stories to tell Scarlett about She-She’s adventures. I’ll send you a note when she arrives (approx. 1 week) to let you know how it works out. THANKS SO MUCH! It might be fun to try to help them come up with some stories about where She-She has been. Any Suggestions????? 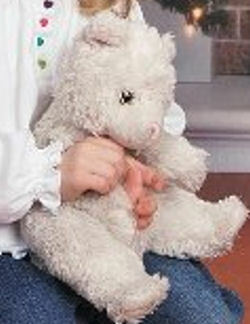 Lost: White Cat obtained from a Sugar Loaf vending machine approx. 1.5years ago. While on vacation in Florida, my 3 year old daughter Scarlett lost her best friend, She She. She She slept with her and pretty much went with her everywhere. She She was a gift from a stranger a little over a year ago who had won her from a Sugar Loaf vending machine in our hometown, Pittsburgh. As soon as we realized she was missing (within a few hours) we went back to the restaurant and retraced our steps with no luck. She She is like a member of our family and definitely my daughter’s best friend. We’ve tried to contact the vendor and gone back to the vending machine without any luck. This simple stuffed animal brought so much comfort and joy to our daughter. Thanks for any help you can give us in finding a replacement is much appreciated. Unfortunately, we don’t have any manufacturing information. Please help, my 3 year old is devastated. If you can help Susan find this White Sugar Loaf Cat, THIS SITE IS NO LONGER ACTIVELY MANAGED. Please use Our FREE FACEBOOK GROUP, including #061608-3 in the subject, . When I mailed out the puppy, I dressed her in a hula skirt (it was a cup decoration from a hula party I went to), and I put a little note in the package about how much I (the puppy) loved being on vacation and wasn’t ready to come home yet. I also put paw prints on the outside of the package, and put some stickers inside for the little owner of the lost puppy. (Kind of like a souvenir from the trip). The woman wrote me back and told me that her daughter was sooo happy to see her puppy again, and she loved the note and the stickers. Of course, I like the story of Go Go Beans traveling the world too!! I love it, Karen. What a creative mind you have!